Shetland crime writer Marsali Taylor talks about the setting of her latest book, "Death in Shetland Waters". It was time to give Shetland a break. In just one year of her life, my intrepid sailing heroine, Cass Lynch, had tackled a film star murder, international art thieves, a coven of witches, a missing sailor and a troupe of opera starts ... along with the short stories, I'd committed over twenty murders in this crime-free community. 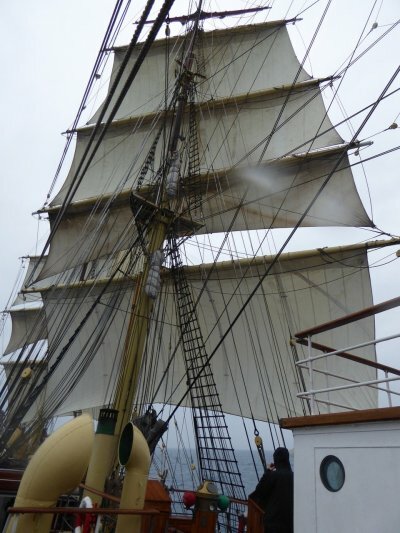 Luckily, Cass had also been doing a college course, to qualify her as a ship's officer - so I gave her a post aboard 'Sorlandet', the smallest of Norway's three Tall Ships. 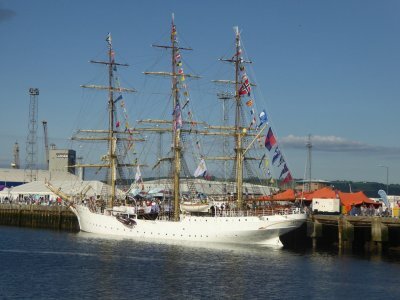 All I had to do was book a berth on a suitable journey for my story: from Kristiansand to Belfast, as part of the 2016 Tall Ships Race. It turned out an unusual voyage. 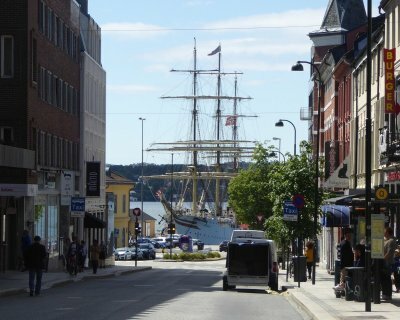 Kristiansand's enlightened social work department had filled the ship with youngsters: immigrant children from Greece, Ethiopia and Iran, Norwegian youngsters in difficult circumstances. Gathered together on the dock, some were clowning to hide apprehension, some were sullenly silent. One face particularly struck me: a girl wearing a Bob Marley fleece jacket, and a hat like a policewoman's, pulled well down over her brow. Her ferocious scowl said 'awkward' to my ex-teacher's eye; a right sea-lawyer there. 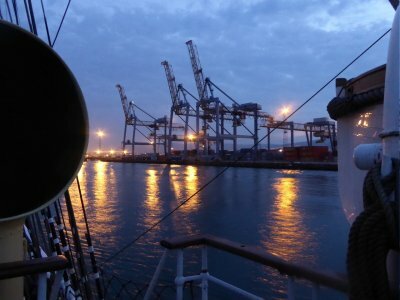 We were split into our watches, and introduced to the ship: hammocks, lockers, toilets and showers forward, navigation aft. Then it was climbing time. The youngsters' eyes lit up. 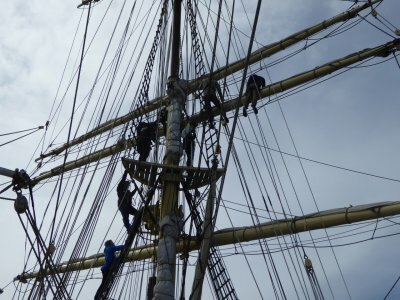 To an adventurous teenager, a tall ship's rigging is a play ground, and they put on their harnesses and headed up the spider's web ratlines with enthusiasm. 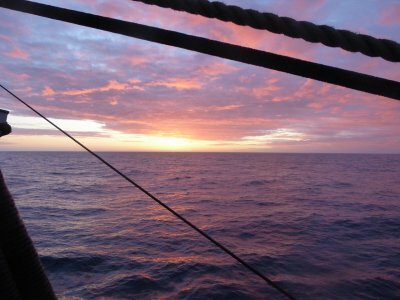 Me, I have a lousy head for heights, and after one foray along the yards, for pride's sake, I was happy to stay at deck level, taking my turn at lookout and safety watch, and standing under the tiers of sails with my hands on the great ship's wheel, and my eyes on the horizon. It was a glorious voyage. We passed rock-polished coast with little white lighthouses, capped with red cones, and headed out into the ocean, sailing blindly through the mist. I was on lookout then, with two brothers, and all agreed how good it was to have a real job: with the radar off to let the rest of our watch stow the foremost sails, the safety of all of us really did depend on their sharp eyesight. Further out, the sea became the colour aquamarine was called for, and a pod of dolphins came to surf our bow-wake. By now the youngsters had stopped being strangers. They'd responded magnificently to shipboard discipline, and even sulky Gabriel appeared on time for watch. Our team was the fastest launching the Man Overboard boat. Intelligent, wayward Sindre translated for the Ethiopians, and Kjell Sigurd learned everyone's tea/coffee preferences, and brought welcome cups of tea to lonely foredeck watchers. As for the girl with the scowl ... Lena was a star in the rig, and enjoyed herself so much that she joined in all the other watches too. I'm sorry to say I caused mayhem among them. Word got around, of course, that I was an author looking for ideas ... and so I got them. Loads of them; even our dignified Captain Sture sidled up to me, and said,'You know if I was going to dispose of a body on board ...' This is why these murders are probably the nastiest Cass has had to deal with ... committed by an appropriately nasty murderer. After a magical two days of nothing but sea all around us, we sighted Fair Isle, then Orkney. Not long after that, we were slipping down the west coast of Scotland, with the sea back to polished pewter, and a day after that we sighted Ireland. The arms of Belfast Lough stretched out to enclose us, and we came in under four great cranes like mechanical horses. 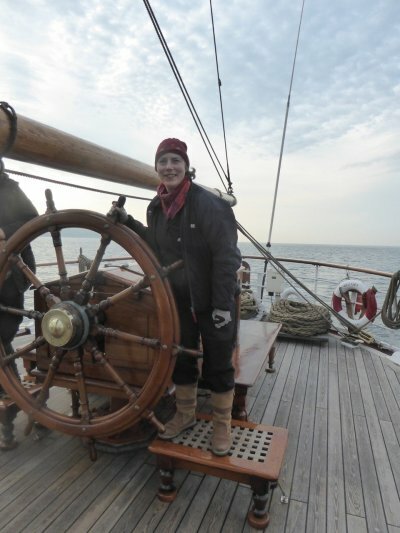 My proudest moment was helming her in, with Captain Sture himself giving me orders. It had been a wonderful voyage. I never use real people in my books, but my watchmates were dead keen to be included, so, with their permission, they're all there, with my best wishes for their future ... and no, none of them is allowed to be either perpetrator or victim of the murderous events Cass has to deal with on board! Marsali Taylor's latest book "Death in Shetland Waters" was published on 23rd November 2017 and is available from the Shetland Times Bookshop or online from Amazon. Check out Marsali's website or join her on her Facebook author page.